Pharma can benefit from mHealth solutions by using them in clinical trials, and by offering them to healthcare providers as part of a comprehensive treatment solution. The healthcare industry is widely adopting digital technologies. But, today’s healthcare providers are extremely busy between seeing patients and filing paperwork, which limits their time online. Nowadays, more than 80% of HCPs have a desktop/laptop computer and a smartphone, and 72% own a tablet. Mobile assets are rapidly becoming components in the clinical environment. Pharma can benefit from mHealth solutions by offering them to healthcare providers, and help them satisfy their needs – improving health outcomes, information sharing, and staying updated with the latest treatments. Providing this type of solution will not only facilitate their customers’ jobs, but they will also open new doors and new opportunities to propose comprehensive treatment solutions. Pharma should reach out to healthcare providers and offer them digital tools, content, and communities that can help them do their jobs more efficiently. 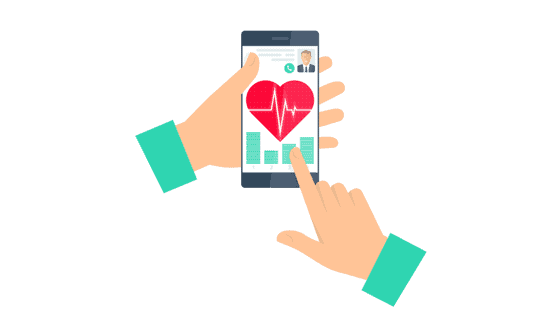 Given the challenges faced during clinical trials, it is only natural that pharma turns to mHealth solutions to help them recruit patients, as well as monitoring and measuring their results. Subjects are much more likely to participate in a study if they have the possibility to raise their concerns or ask any questions 24/7. Pharma can benefit from mHealth solutions, since these tools can collect even more data in real-time, improve efficiencies in time and costs, shorten timelines, as well as increase patient satisfaction, retention, and future recruitment. A key element of success when using mHealth solutions for clinical trials is the ease with which mHealth solutions can collect data, and how that information is integrated into the whole clinical database. These data integrations should be done as closely as possible to real-time, making it easy for clinicians to visualise all the patients’ data. Conducting clinical studies using mobile devices can help collect and monitor behavioural data and vital signs in patients. These solutions can also work as medication reminders and gather patient feedback – all these improve the decision-making process when developing new medicines. Monsenso can provide Pharma companies with a customised, white-label mHealth solution for their clients and to use on clinical trials. If you are interested in learning more about this, click here.